I love olives and Mediterranean flavors! I had seen recipes for zucchini boats Mexican style and parmesan style, so I had the idea of adding some olives, Feta cheese and spices to make them Mediterranean! This is one of those recipes that are incredibly simple, quick to make, and above all, healthy! And my kids loved this idea of a zucchini "boat"!! 1. Heat your oven to 400*F. Line a casserole dish or baking 9 x 13 pan with parchment paper and set aside. 2. In a large skillet over medium heat, melt coconut oil and sautee the onions and garlic until translucent (about 4 minutes). 3. Add the ground chicken/turkey to the skillet, along with the oregano, salt and pepper. the chicken until cooked thoroughly. The last 2 minutes of cooking the chicken, place the tomatoes and olives in with the poultry. 4. 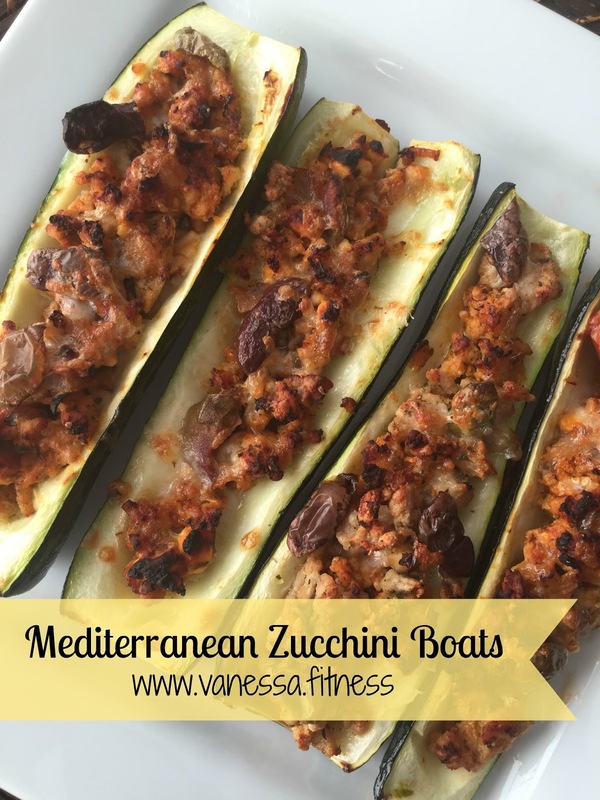 Place the zucchini boats in the lined pan and place the ground chicken/turkey mixture into the scooped out area of the boats. Bake for 15-20 minutes, or until the zucchinis start to become tender. 5. Top with the Feta cheese. Place back in the oven for 1-2 minutes, or until the cheese starts to get soft. 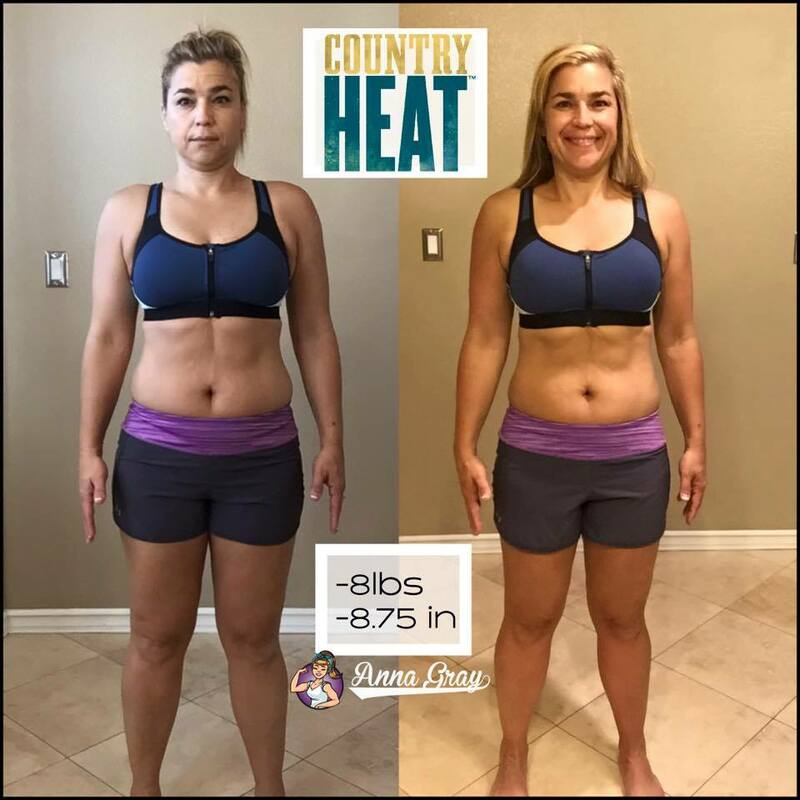 You're INVITED to the COUNTRY HEAT Test Group! Starting August 8, I will run a TEST GROUP for the launch of this program! And in my groups, my customers ROCK new programs and their results have been rewarded! AND, I will be doing the program and participate in the group not only as a coach, but also as a challenger! Will you be one of the 10 participants I am allowed to coach through the 30 day program??? Potential $500 winnings for sharing your results? I am 100% IN and ready to lead! Country Heat is a high-energy, low-impact dance workout that's so simple and so fun, you'll love it from the very first step. Each 30-minute routine is packed with easy-to-follow dance moves set to the hottest country music around. 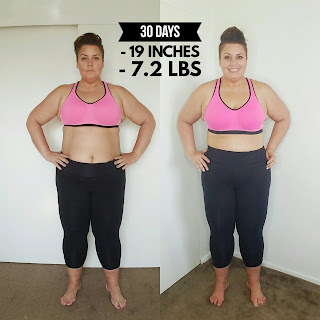 All you have to do is follow along and before you know it, you're scorching calories, burning fat, and melting away the pounds as you reshape your entire body – all in just 30 days. Who is the IDEAL Heat Participant? Anyone who's looking for a simple, fun, and effective way to lose weight and get fit. While Country Heat is perfect for beginners, it's also a great cardio-based workout for people at all fitness levels who like to dance or want to stay in shape. It's also a great choice for people who like to dance but are intimidated by choreography. There are no complicated moves, no weights or equipment—just follow along and you'll be dancing right from Day One. Also great for anyone looking for a low-impact exercise program (no jumping or weights). ** As a thank you to all of my test group participants, I will include Autumn's exclusive bonus workout, Dance Mash-Up. ***Upon completion of the program each participant will receive a free t-shirt when they submitting their results and could potentially win $500 or more! 1. Participants will be expected to check in daily to our accountability group using the challenge group tracker app. 3. Tracking results is absolutely required! 4. 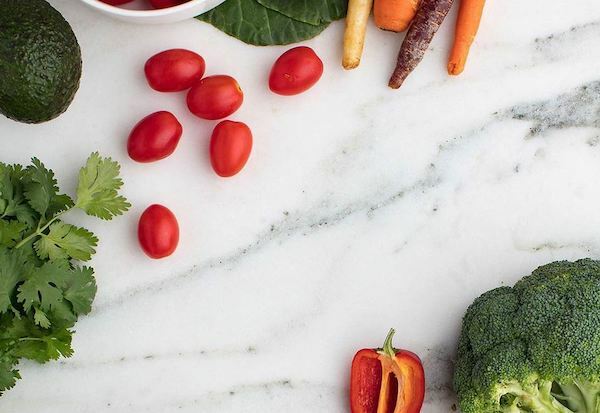 Participants will be given a variety of recipes, meal ideas, and snack options, but will be expected to follow a meal plan designed to help them lose weight, shred fat, and build muscle. Meal plan options will be provided. 5. One meal a day will be replaced with nutrient dense Shakeology. Shakeology is a complete meal replacement that will be part of the included meal plans designed to help you optimize results. 1. Complete the application below to be added to the launch email list. You will receive an email update once you've submitted the application. 2. The program will be released on July 28. Participants will receive a link to a discounted test group challenge pack which includes all the necessary workouts, meal plans, and challenge tracker account information needed for the test group. The only cost is that of the challenge pack. 3. Refer a buddy and receive the Fixate Cookbook! It will help you bring best nutrition to this amazing workout. Do you ever wish you could change? That you would have done things differently in the past to either take a different path in life, or wish you would have taken health and fitness more seriously, or do you ever want to have like super power confidence that just radiates when you walk into a room? Do you ever wish that you could look as good as you did in those pictures where you 'thought you were fat (let's be real. we've all been there) and you just WISH you could change- but are so tired of getting frustrated, confused and are skeptical of trying something else because you want to know for sure it WILL work for you this time!! AND... Summertime is all about SURVIVAL MODE!! Right? Because I don't know about you, but margartias, mojitos, fro-yo, hotdogs, pizza, and summer life can easily swallow me up if I let it! 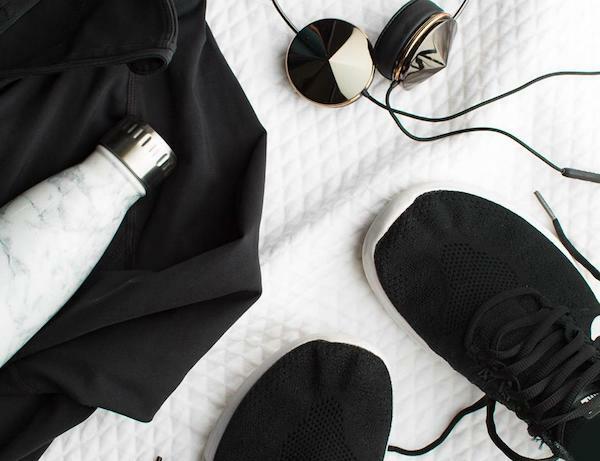 And while I do splurge sometimes, I have learned so much about my own personal health & fitness that I LIKE to stay on track because I never want to fall back into my old habits. And guess what I have a PASSION for doing? Teaching other people how to do the same! 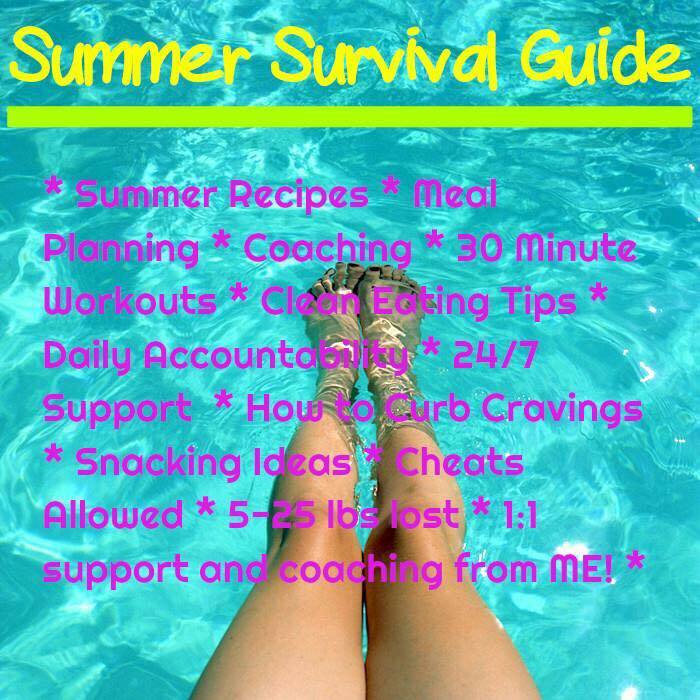 You are invited to join me for 4 weeks for some summertime accountability! The group will begin on August 1! -no counting calories or points. -no treadmills or wandering aimlessly around the gym! -Balance between those summer treats and your goals. -How to travel and eat healthy. -How to make a meal plan. -30 minute total body workouts. -At least 1 cheat meal per week. My goal is to teach you how to make a lifestyle change, not a crash diet, or something you feel deprived by! My goal is to give you tools that will last forever! Stop the negative self talk. Stop the "I can't eat that," or "I need to go to the gym today." Stop wandering around the gym feeling clueless about what to do and feeling like everyone is staring at you! Stop jumping on a treadmill thinking that is going to get you to your goals! 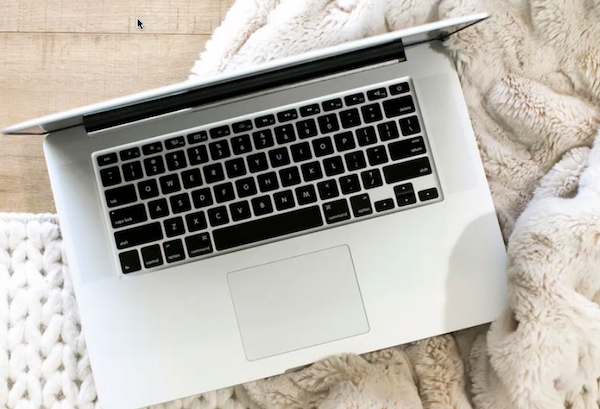 We will start with seven days of PREP complete with meal planning, new ideas, recipes and tips to help you get up and running followed by our three week – 21 DAY Challenge! There will only be 10 participants selected this round so it will be based on a first come first serve basis!!!! The first three people who enrol by the end of day July 25 will receive a $25 Amazon gift card!! Fill out the application below, invite some friends & get pumped up!!! If you invite a friend who enrolls, you will be double entered in the drawing! 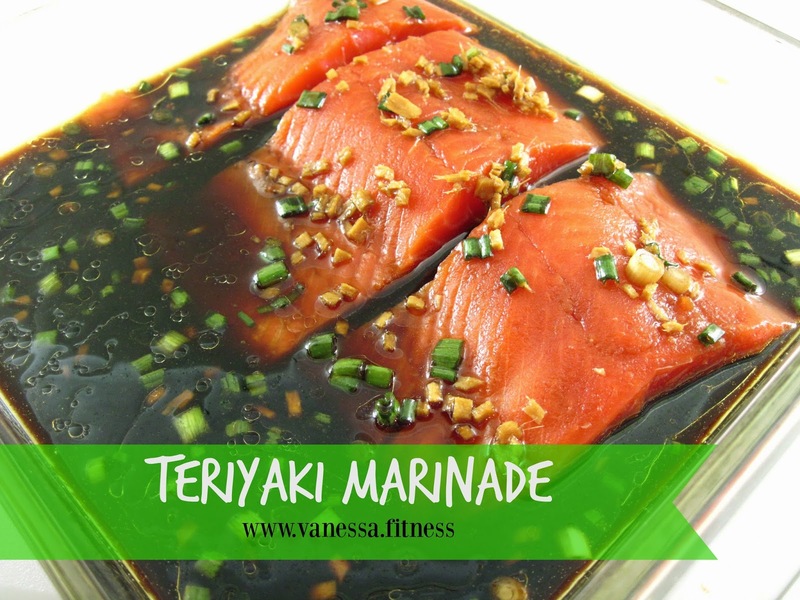 I found this recipe when I was looking for a clean eating alternative to store bought, bottled, marinades. It's tangy and a breeze to prepare. Use it on salmon or chicken or anything you think needs some flavor. Combine all ingredients and place meat or fish in shallow baking dish and marinate for 20 minutes in refrigerator. Turn the meat a few times to distribute the marinade evenly. Cook meat/poultry/fish as needed. This is a fabulously versatile recipe to substitute for fried wings. Makes great wraps for Sunday afternoon football, the leftovers, if there are any, are a great addition to salad the next day, any my picky kids who like their chicken "not touching" anything can have this in a bowl by itself, or use it as a topping on a sweet potato. 1. In the crockpot, combine chicken, onion, celery, garlic and broth (enough to almost cover the chicken - use water if the 16 oz. of broth isn't enough.) Cover and cook on high for 4 hours or low for 6 hours. 2. Remove the chicken from the crockpot and put aside 1/2 cup of the broth. Dump the rest. Shred the chicken with 2 forks. 3. Return chicken to the slow cooker and add the 1/2 cup of broth plus the hot sauce. 4. Cook on high for another 30 minutes. 5. 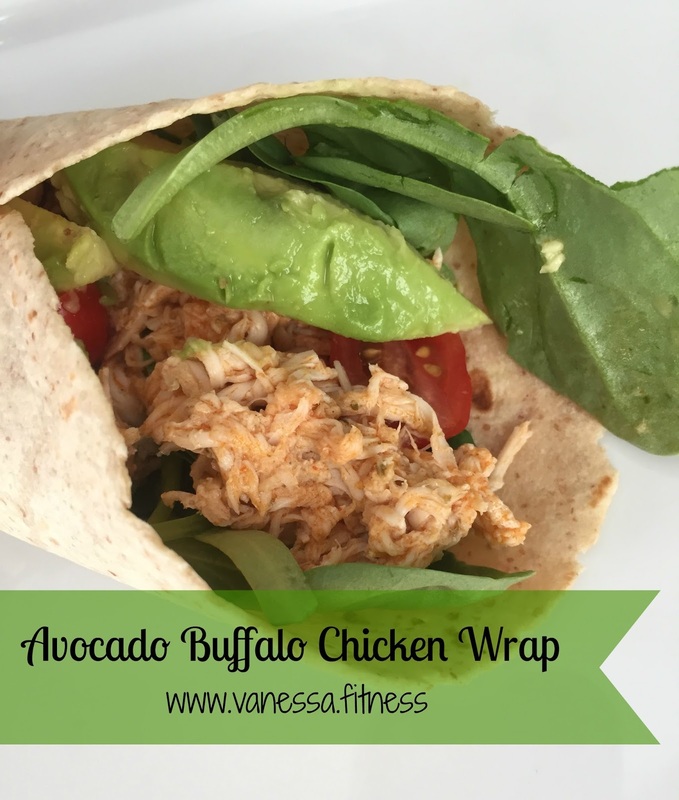 Assemble wraps by placing tortilla on plate, topping with spinach/lettuce, diced tomato, 1/4 of sliced avocado, chicken, and 1/8 cup of cheese. Roll and enjoy! Buffalo chicken sweet potatoes (bake potatoes in oven or microwave), cool, cut in 1/2 horizontally. Top each half with chicken, and sprinkle with 1 tsp blue cheese each. Place potatoes on foil lined baking sheet, season with salt & pepper and bake iTop with 1 tsp blue cheese, shredded carrots and celery. I LOVE this meal because it's quick, it works without having to remember to marinate the chicken, and you can make it in ONE pot! 2. Spray non stick skillet with cooking spray and heat to medium high. 3. Add the chicken and saute until brown on one side. 4. 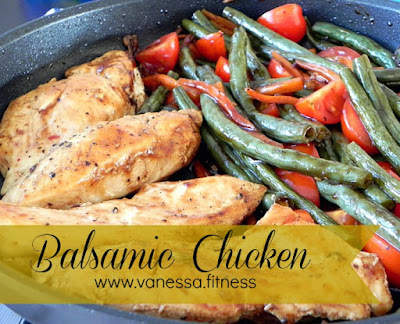 Add garlic and flip over chicken breasts and add green beans and tomatoes. Continue cooking while stirring vegetables. 6. Cover and simmer over medium low heat for 10 minutes, stirring occasionally. Remove chicken and vegetables, set aside and keep warm. 7. Continue simmering sauce, uncovered for about 7 minutes. Discard bay leaf and pour mixture over chicken and serve. 8. Make extra and use for your salad or lunch the next day, tastes delicious after it has been sitting in that sauce all night! 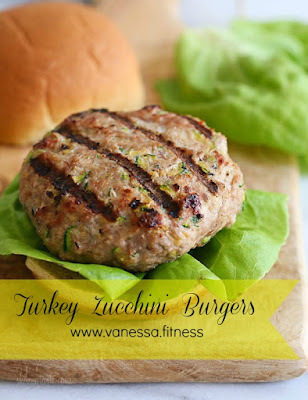 Borrowed and adapted from Skinnytaste.com, these are my go-to burger in the summer, because of the plentiful zucchini at the farmer's markets. I typically double the recipe to have leftovers. Also, I don't cook about 3 to 4 burgers, and instead individually wrap and freeze them for the future. 1. Grate zucchini and squeeze the excess moisture from the zucchini out in a paper towel. 2. In a large bowl, combine the ground turkey, shredded zucchini, flax seed, garlic, onion, mustard, egg, salt & pepper. Mix. 3. Form ground turkey mixture into roughly 4 or 5 patties. Try to get them as flat as possible. 4. Heat grill on medium-high heat. Lightly spray patties with oil. Place the burgers on the grill and reduce the heat to medium-low. Cook until browned, about 4 minutes, then flip and cook another 4 minutes, be careful not to burn! **Make these into cheesy, smoky bacon cheeseburgers by adding 2 strips of cooked turkey bacon, and one thin slice of mozzarella cheese.